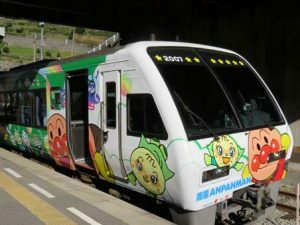 The All Shikoku Rail Pass permits unlimited travel (2-5 consecutive days) on all JR Shikoku services (up to Kojima station on Honshu) as well as those provided by private rail companies (Kotoden, Iyotetsu, Tosaden, Tosa Kuroshio and Asato). The passes can be bought in Japan, but it costs ¥500 more. Prices are fixed in yen, but the charge is payable in local currency. The prices and conversion equivalents quoted here are those valid in April 2017; they are not those quoted in the 4th edition of Japan by Rail. However, the exact cost will depend on the exchange rate used by your rail pass agent at the time of purchase. It’s worth shopping around as agencies apply different exchange rates. Children aged 5 and under travel free providing they do not occupy a seat; those aged 6-11 pay half the adult rate. For more details see JR Shikoku‘s website and for itinerary suggestions see p47 in Japan by Rail.